Dental Care and Surgery - Country Veterinary Clinic, P.C. Despite what many pet owners may believe, bad dog or cat breath is not just a nuisance, it is a sign of an unhealthy mouth. Bad breath is caused by bacteria. Over time, bacteria leads to plaque and tartar buildup on your pet's teeth. The result is bad breath, reddened gums, and other common signs of dental disease. As dental disease progresses, other signs can include drooling, swollen areas on the face, discomfort while chewing, and loose or missing teeth. Even if you are using treats and chews to help control tartar, these are frequently not enough to keep dental disease under control. Regular professional cleaning is important to maintaining your pet's teeth. We use modern and safe ultrasonic scaling to clean each tooth thoroughly, above and below the gum line. Dental technicians polish teeth to create a smooth tooth surface that is more resistant to plaque buildup. Modern surgical tooth extraction techniques and local anesthetics are utilized by our veterinarians. Dental hygiene is an important part of your pet's health because dental disease can be associated with other serious health problems such as heart disease and kidney disease. How do you know if your pet has a healthy mouth? Let us examine your pet's teeth and gums to help determine if there are any dental issues you should know about. Some pets may have undetected broken teeth from chewing bones, rocks, or cages. Root abscesses can also develop unseen, but can cause potentially serious oral problems. This is where dental x-rays come into play. After a brief visual examination, we may recommend a more detailed examination (which requires sedation), a dental cleaning, or options for at-home dental care. We are proud to offer the ability to take digital dental radiographs on our patients! Our standards indicate a higher level of oral care for our patients and dental radiology is a vital part of those standards. Full-mouth x-rays are strongly recommended on every patient but especially those that are considered "senior" pets or pets who already have advanced dental disease. Considering most dental disease lies below the gum line, digital radiography is necessary and crucial for the accurate evaluation of periodontal disease. Digital radiography allows our technicians and veterinarians to view your pet's internal anatomy of the teeth, the roots, and bone structures that surround each tooth. 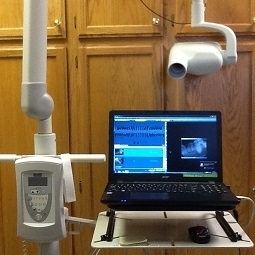 Dental x-rays are one of the most important diagnostic tools available when deciding if a tooth needs to be extracted. Digital x-rays are painless and a safe way to get a complete oral "picture" of your pet's health. We want your pet to live a long, healthy life, and we understand that maintaining a healthy mouth is part of that. Your pet's health is important to us. Please let us help you with this committment.